The ruins of an Augustinian priory church in Walsingham, Norfolk, recall the pre-reformation days when the village was one of Europe’s greatest centres of pilgrimage. According to legend, Lady Richeldis, wife of a Norman lord, had a vision here in 1061 in which the Virgin Mary appeared to her, took her in spirit to Christ’s home in Nazareth and commanded her to build an exact replica of it in Walsingham. With heavenly aid, she built the Walsingham shrine, which soon became so famous that pilgrims came there from all over Europe – Edward the Confessor, Richard the Lionheart and Erasmus the scholar among them. Miraculous healing powers were attributed to Our Lady’s Well and even the Milky Way became known as the Walsingham Way, for it pointed across the heavens to England’s Nazareth. At the Reformation, however, the shrine and all the buildings that clustered around it were destroyed and the Slipper Chapel en route to the shrine became a barn. It was not until 1934 that sufficient funds were found to fully restore the Slipper Chapel that has since become the Catholic shrine. 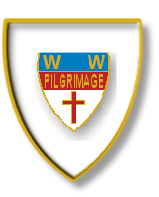 Today, Walsingham enjoys again some of its former glory and at Whitsun and on other Church festivals, pilgrims once more flock into the village as they did centuries ago in medieval England.